Everywhere I turn in the New Testament I find confirmation to the doctrine of non-resistance to evil. Paul in his writings confirms non-resistance in many places, but I never expected to find confirmation in his epistle of joy, the letter to the Philippians. How many times do we do our devotional readings and go away not remembering a single thing about what was read? I have to admit that I have done that too many times, but I have also read Philippians slowly and consciously and still miss hidden treasures. Once I was enlightened to the doctrine of non-resistance to evil, nearly all of the difficult scriptures fell into place; the pieces of the puzzle came together into a beautiful pictures of joy and peace, with God and with man. I was not looking for confirmation to that doctrine, I had already accepted it, but what I wasn’t looking for presented itself like a flash of light. With the doctrine of non-resistance is attached another doctrine closely related to it, and that is the doctrine of non-involvement in the politics of this world. Politics and patriotism have nothing to do with Christianity at all, and Paul addresses the wrong spirit of many Christians in his letter to the Philippians. Human nature is 180º out of sync with the truth and always seeks what is best, for its own skin. Selfishness and self-preservation is the mark of fallen mankind and the beast that lives within him. Paul is not speaking to pagans here, he is speaking to the Church. Any Christian who looks out for #1 is no Christian, he is a false believer and a slave to the evil one. Could this be the “mark of the beast,” “ the number of man” “666,” that distinguishing mark that separates believer from un-believer? The mark of selfishness. Paul continues with his words of caution in the midst of his words of JOY. 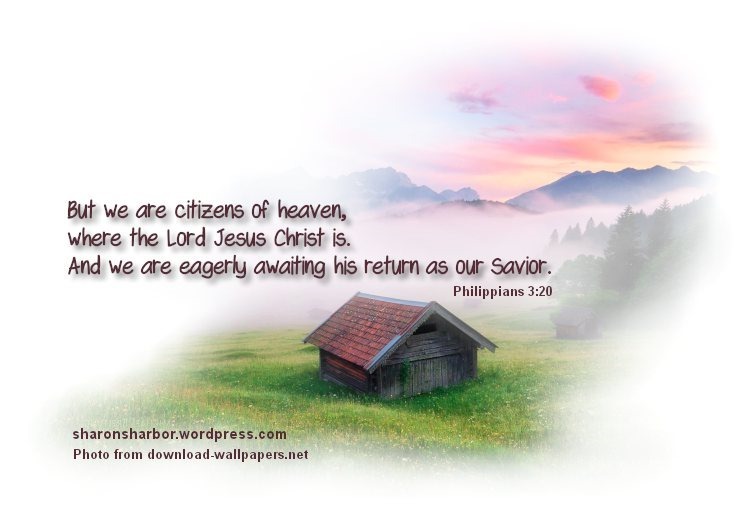 He ends Chapter 3 with this note of watchfulness, Phil. 3:17-21. Paul’s position was non-political and admonishes Christians to follow his example. Then he warns true believers that many so called believers are not believers at all, but rather he classifies them as enemies of the cross of Christ. Their lives are exemplified by holy talk and selfishness. Their actions support a life indistinguishable from those of the world. Their god is their own desires and their glory are those things of which they should be ashamed. Their minds are set on those things which can bring them the most comfort and safety and the preservation of their way of life. True believers know that they are wanders and strangers in this world and that they have no interest or regard for the institutions of this world; they have one citizenship ONLY and that is in Heaven, ruled by a powerful King who will at His appointed time bring everything under His control, with no election process. For all of those who believe this and have chosen to die to this world and its ruler, Satan, they will be rewarded with a transformation, a metamorphoses, from these lowly bodies of decaying flesh to glorious bodies that will never decay or die. All of this is based on the truth of the Christian religion, backed-up by miracles, prophecy, and the resurrection of the Lord Jesus Christ. Unbeliever take notice, some day you will die, and forever regret your choice. Pseudo-believer take notice, some day you too will die, and forever regret your choice. How divided organized Christianity over these issues… But those of true faith “desire a better country” (Heb. 11:13-16), for they know that they “have died and their life is hidden with Christ” (Col. 3:1-4). I totally agree! Exactly! Yet so many are not willing to let go of these things and have a stranglehold on them. They don’t really adhere to what the bible teaches. I’m glad I’m not alone in this stand. I felt alone already back in the late 80’s when church life was all about being a devout Republican; electing the next rulers that would bring heaven on earth all while hating on the poor and loving the rich and powerful. It was all about war and the troops. And stepping right over the oppressed.